Product #3828 | SKU LHI | 0.0 (no ratings yet) Thanks for your rating! AJA drivers offer integrated support for Apple Final Cut Studio. The AJA KONA LHi bridges the gap between legacy analog devices and the latest 3G SDI and HDMI v1.3a enabled products. The AJA KONA LHi bridges the gap between legacy analog devices and the latest 3G SDI and HDMI v1.3a enabled products. KONA LHi interfaces with the latest PCIe Apple Mac OSX hardware and QuickTime software applications. Editing, monitoring and mastering of professional quality video in an affordable, easy to use product. 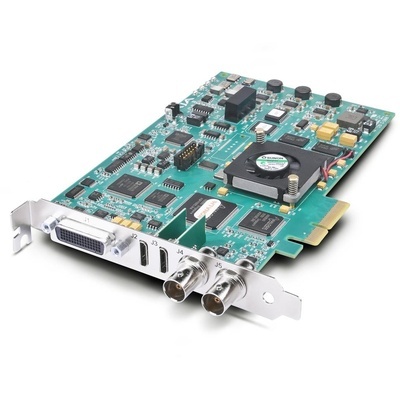 10 or 8-bit uncompressed video, 3G/HD/SD SDI I/O including support for 1080p50/60, analog composite/S-Video/SD-HD component video I/O, 2-channel AES/8-channel SDI embedded audio I/O, 2-channel balanced audio I/O, and broadcastquality hardware-based up/down/cross-conversion for flexible SD and HD post production. HDMI v1.3a capability at 30 bits per pixel allows full support of the latest 10-bit monitors. Use the KONA LHi hardware-based flexible connectivity to capture to QuickTime™ at 10-bit and 8-bit uncompressed formats as well as Apple ProRes 422, DVCPRO HD and more. The KONA LHi comes standard with a breakout cable and can also be connected to an optional breakout box for rack mounted I/O convenience and added connectivity in the form of additional BNC digital AES/EBU connectors and RCA monitoring jacks.